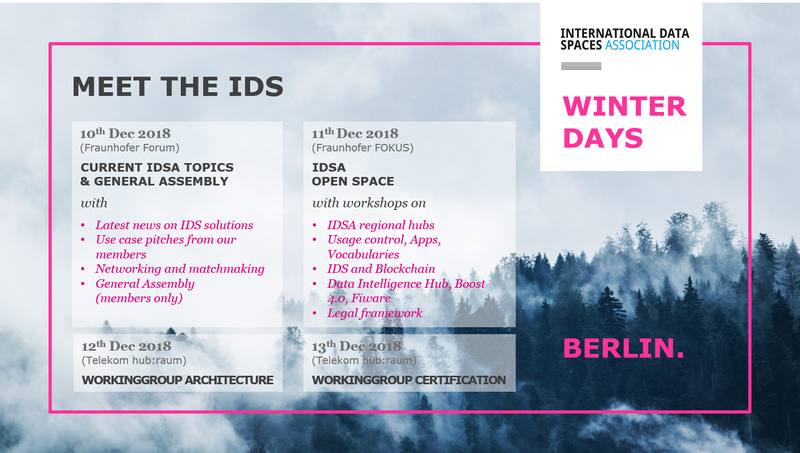 IDSA Winterdays celebrates a collection of events from General Assembly meeting, Working Group meetings to discussion of use cases, among which, Boost 4.0 WP3 working group meeting will be held on Open Space Agenda, Dec 11, 2018 at Berlin. The IDSA Open Space gives everyone the opportunity to present their IDS-relevant topics in a relaxed atmosphere. In any case we provide the matchmaking wall to exchange ideas with potential business partners and meet them. This whole day shall hold as breeding ground for building new connections and to get insights into different perspectives. Please register for the IDSA Open Space on December 11th by using this Link.